The camera that Morrissey uses in "Suedehead". Discussion in 'General Discussion archive 2005 (read-only)' started by Librarian on Fire, Feb 2, 2005. I'm not sure if anyone is interested (it is a pretty geeky post even I admit that) but I'm about 98% sure that the camera Morrissey uses in the "Seudehead" video is a 1950's Agfa Isolette. Morrissey uses it to take a photo outside a building. Also the camera is propped up against the window frame in another view. 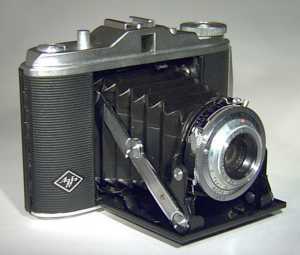 These lovely folding cameras can be picked up for around 10 pounds in camera shops. Maybe even less on online auctions. They use 120mm film, which is rather hard to get these days. You have to spool it on to another spool. I hope Morrissey knew that because he does depress the shutter on the camera in the video. Maybe something to buy to add to your Morrissey collection. I wonder what the photo came out like. > the window frame in another view. > I wonder what the photo came out like.